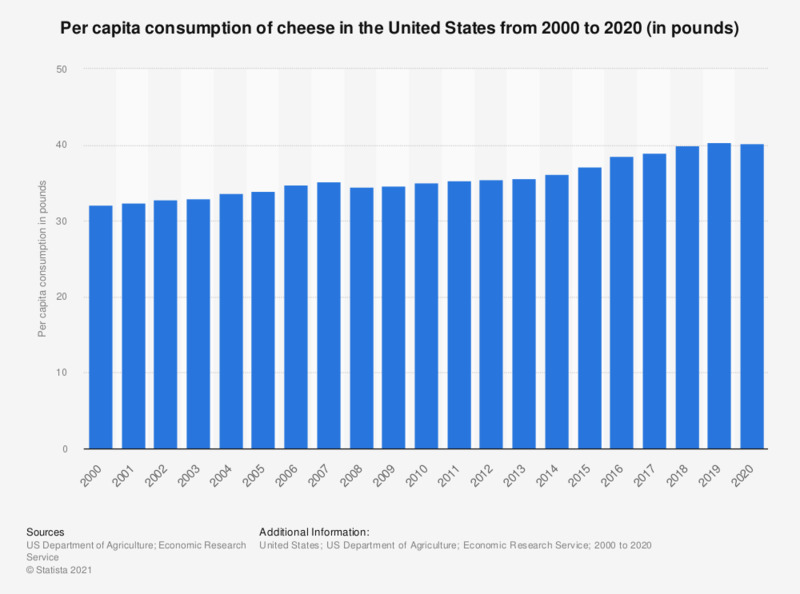 The timeline pictures the per capita consumption of cheese in the United States from 2000 to 2017. The per capita consumption of the entire cheese category in the United States amounted to about 39 pounds in 2017. According to ERS all per capita consumption figures are calculated using resident population plus the Armed Forces overseas. Cheese includes American, Italian, and other cheese. Excludes full-skim American, cottage, pot, and baker's cheese. U.S. population: Do you eat grated cheese? U.S. population: Which types of grated cheese do you eat most often? U.S. population: Do you eat natural or imported cheese?